There are total 196 countries in the world and each country has its own specialty. Today I am going to share about one of the Nobel country which is famous for its heritage culture and lifestyle. India is famous for its heritage culture. The World Heritage Committee has listed more than 40 heritage sites to visit in India. India consists of 29 states and one of the outstanding thing is each state has their own language. Each state has variation in food and lifestyle. 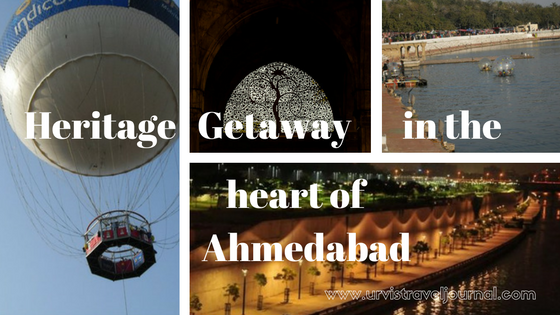 I am sharing my experience of a heritage getaway in the state of Gujarat. Gujarat is the seventh largest state in India and 10th most popular state among the tourists. Gujarat is in the western part of India with a coastline of more than 1500 km. Gujarat offers scenic beauty from Great Rann of Kutch to the hills of Saputara. Besides scenic views, it also has hisory from Solanki rulers to Mughal rulers, great freedom fighters to intelligent businessman. During my last trip to Ahmedabad, I got a chance to explore the archaeological sites of Ahmedabad. Ahmedabad name came from the king “Ahmed shah”. Ahmedabad is famous for “sidi saiyad mosque”. This city attracts archaeological lovers a lot. Many architecture professions also come to explore the heritage of the city. It has many heritage style private mansions as well. For me, viewing ancient structure and doing photography is not enough. How about you get a chance to live in the heritage mansion? As I mentioned earlier India is known for its heritage culture and if you want to experience it closely then choose your stay in the old mansion rather than simple hotel. Many of the private mansions are converted into the hotel by the owners. Today I am sharing one of my experience to stay in the “Mani Mansion”. Mani Mansion is a 90 year old heritage property owned by Dalal Family. This Mansion built by Manibhai Dalal in the year 1921, the Mansion continues to resemble the magnificence of its original architecture even today. Mani Mansion have been refurbished to match the modern day demands of an urbane stay. It is a result of adding minor touches of urban architecture to one of Ahmadabad’s finest properties. A stay at Mani Mansion is equivalent to the magnificence of staying in a heritage property that has once housed eminent literary personalities, well known poets and legendary musician. There are rooms in the Mansion that still carry the essence of their artistic creativity. The Mansion is known as “Haveli” in the local language. These Mansion was beyond my expectation. The moment I decided to share my experience on the blog, I was confused from where to start. So I decided to share my experience in five different parts. I was so impressed with the all little details in the Mansion. As we all know Mansion means a large, impressive house. As I said this house belongs to Dalal family and they decided to share this heritage property with others and convert this beautiful place in to heritage hotel. We very well know that people love India culture and they frequently visit to explore heritage sites. The moment you enter into the hotel you feel like it’s home. You will find uniqueness from door to window, chair to bed. Everything has been carved with heritage style. I love the staff, they are very welcoming. The moment I enter through the gate it feels like different world. All those carving will remind you Mughal lifestyle. These are little glimpse of Mani Mansion. Come back to read next part of the story. Your post swept me away in huge waves of nostalgia of Ahmedabad, a city that I grew up in. The best part of Ahmedabad for me always remains the colourful kites and the lovely and warm people of the city. I know the feeling… traveling somewhere and having SO much to share! A 5 part post is a great way! 🙂 The trip looks amazing… the Mani Mansion sounds amazing! Haven’t been to Ahmedabad but I have been to India and loved it. I actually ended up spending over 7 months there. I really want to go back and now there’s another place i need to visit. Thanks for this. Wow beautiful! Looks like a place with lots of history. That’s a lovely city! I’ve never been there before but I would love to visit someday! Thank you for the brief history, it’s always awesome to learn more about a new place! Oh, this place looks so awesome. Traveling out of the country is very nice. My husband has been to India twice and loved it. I have been to nearby Nepal, but not India yet.